This new and exciting event precedes Santa Barbara’s world-famous “Old Spanish Days” Fiesta by a few weeks, and in the spirit of Fiesta, the night is charged with exciting Spanish music, passionate flamenco dancing, and spicy tapas appetizers. Santa Barbara County’s finest wines will be spotlighted along with hot Spanish imports! Don’t miss this festive upscale event! (11:30 am entrance for VIP/Press/Trade) Chase Palm Park Oceanside This is the “Biggest Wine Festival Under the Sun” in Santa Barbara! A spectacular gathering of over 200 of California’s finest wines from every wine region in the state – showcasing a total of over 350 fine wines at our sunny beach front location. Over 2,500 wine fans will grab their glass and start swirling and sipping just a frisbee throw away from the sparkling Pacific, while live music on stage keeps the party going. C’est Cheese takes their cheese seriously! Once a month they hold tastings, classroom style. These monthly tastings generally include 5 cheeses from a given region paired with a complementing glass of wine. 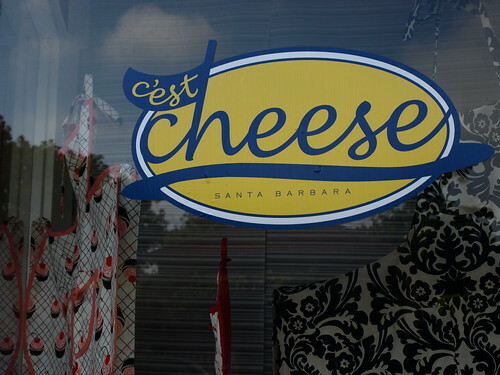 C'est Cheese hosts monthly cheese tastings in downtown Santa Barbara. Sometimes they get a little wild at their cheese tastings and they’ll feature more out of the ordinary pairings, covering such topics as salami, olive oil, vinegar, honey, chocolate or caviar. Atmosphere is casual, welcoming and questions are always welcomed. Below is a listing of all the Wineries & Wine Stores throughout Santa Barbara and Santa Ynez Valley that serve C’est Cheese cheeses at their wine tasting events. C’est Cheese is right in the heart of lovely downtown Santa Barbara, near the corner of Santa Barbara Street and Canon Perdido.